Firstly, there was a good quote across my Bloomberg screen this morning that’s worth re-printing here – it sums up my thinking towards the market / investing / trading. Running portfolios for the last ~15 years, and writing a daily note for most of that can be a really rewarding experience, but it requires a significant amount of humility as well. The ASX200 surged again yesterday to take the weeks / months gains to +1.7%, already ~70% more than the average gain for April over the last decade. Further positive noises on the US – China trade talks sent the S&P500 futures up strongly during our time zone and we followed suit with the main gains in stocks / sectors that would benefit most from an end to the Trump led brinkmanship on trade e.g. BHP Group (BHP) +2.25% and RIO Tinto (RIO) +1.9%. However the gains were fairly broad based as you would expect from a futures led rally courtesy of the ensuing arbitrage. However, the banking sector still appears tired after its solid bounce from the December lows with both ANZ Bank (ANZ) and National Australia Bank (NAB) actually closing in the red along with the Energy sector - but overall it was day when green dominated the screen. At MM we continue to target a 6000 – 6300 trading range for this quarter with the upper band already being tested - we’re only 4 days in the quarter hence from an active perspective after touching 6285 yesterday we are in a more sell mindset hence any buying is likely to be focused in very stock specific situations like Sims Metal (SGM) which we bought yesterday. The ASX200 has now achieved our upside target area switching us back to a neutral / bearish stance short-term. Overnight US markets were quiet with Dow closing up only 39-points, failing to live up to the early expectations, BHP has closed down -0.8% in the US while the SPI futures are pointing to an unchanged open for the ASX200 this morning. Today we are looking to explain why we have no interest in the “yield play” sector moving into 2019 / 2020. 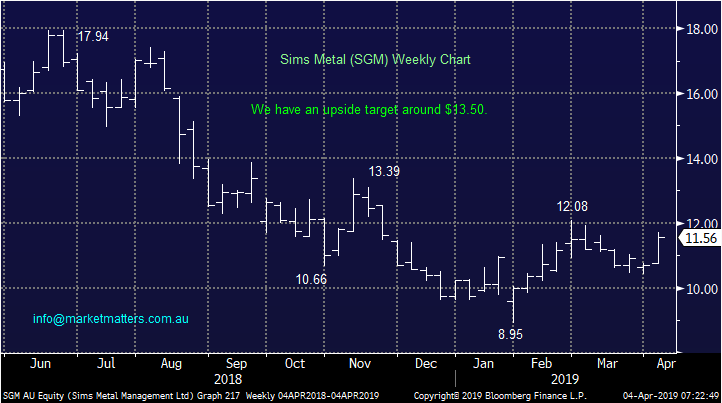 MM bought scrap metal and recycling business Sims Metal (SGM) just above $11.50 yesterday considering the business an excellent candidate as a turnaround story plus a beneficiary of reduced US – China trade tensions, a situation that appears to be improving almost daily. From a technical perspective a break of this weeks low will concern MM i.e. $10.74. MM is bullish SGM initially targeting a 15-20% rally from current levels. Everybody has become so blinkered with the Australian housing correction, calling it ever lower on an almost weekly basis, that its starting to feel like the rhetoric we heard around equities last December - before they surged higher! 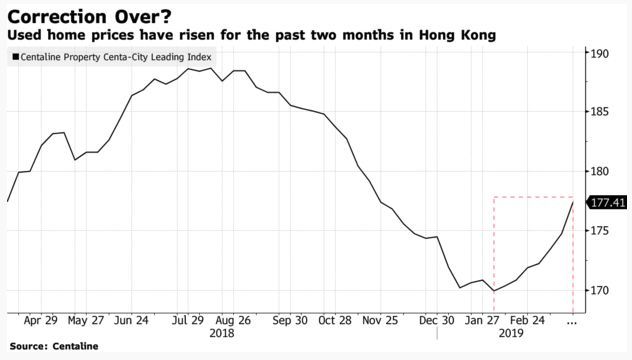 In Hong Kong prices have rallied over the last 2-months after falling from a peak in July 2018 plus new home sales are surging. While the fundamentals are clearly very different between Australia and Hong Kong the one thing they have in common is we / they love property – Hong Kong’s prices have been rallying strongly for over 15-years. Local prices have come back to levels we anticipated around 18-months ago, some rate cuts and / or government stimulus might be all that’s required to turn the local negative sentiment and put sellers back in control. We believe the local downturn has predominantly been caused by a bureaucratic led credit crunch, something that can be relaxed if required. 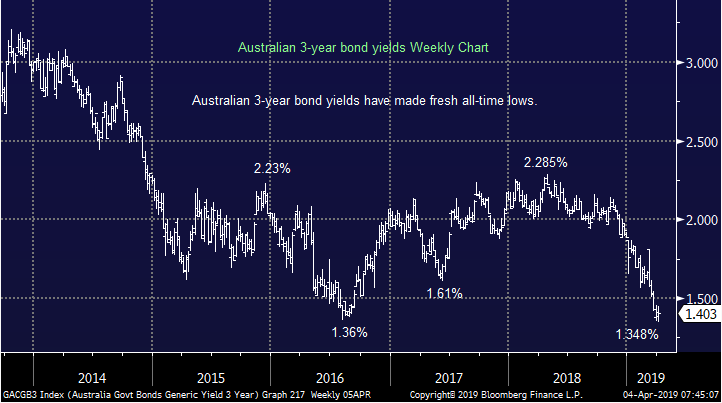 Over the last few weeks we have seen local bond yields join the RBA cash rate at all time lows as fears of a property led recession – the first in 27-years – which has prompted economists to forecast rate cuts moving forward. With the RBA’s official target rate remaining at the lowest level in history at 1.5% we feel the RBA will need to cut twice before the banks will pass on any meaningful rest bite to mortgage paying Australians. The concern we have is lower rates are already built into the market yet they remain far from a foregone conclusion. Hence from a risk / reward perspective chasing yield at this point in time is fraught with danger and it actually reminds us of the period in 2015 when investors bought banks with a herd like mentality only to see their capital diminish rapidly, even while dividends were maintained. 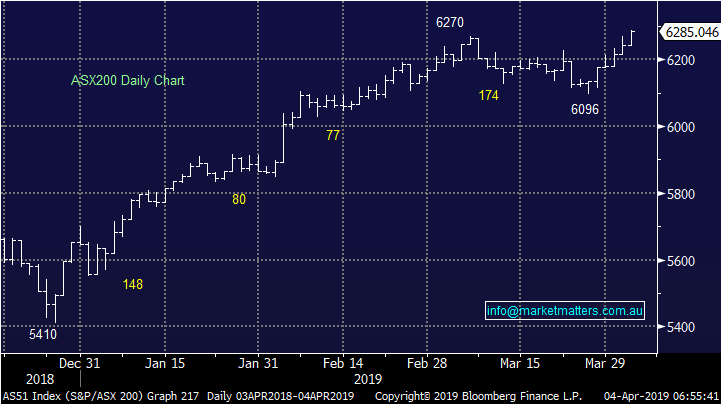 MM believe the picture is fairly similar in the US and while there are no sell signals at this point in time, either technically or fundamentally, we can easily see another 15-20% correction in 2019-2020 – some economic optimism leading to higher bond yields is an obvious candidate. Our view at this stage would be to sell into strength anticipating better opportunities down the track. 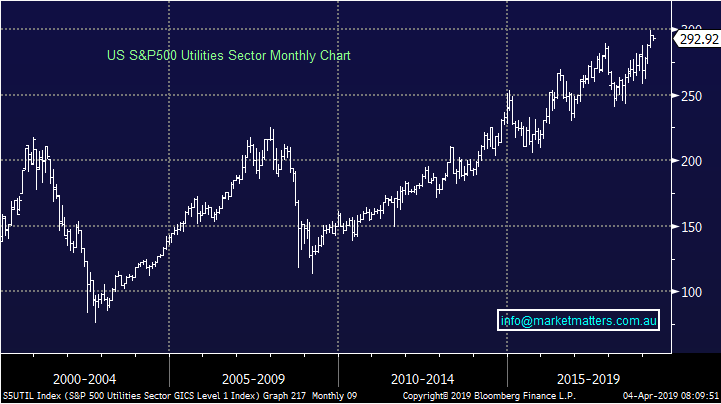 The risk / reward now feels average at best with the US Utilities Sector. 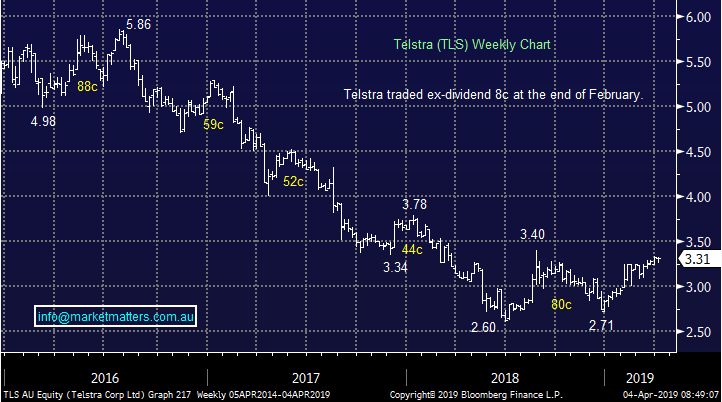 Today we have looked at 3 classic Australian “yield play” stocks, definite market and investor favourites since the GFC but as we have seen with property over the last 12-months all good things do come to an end. 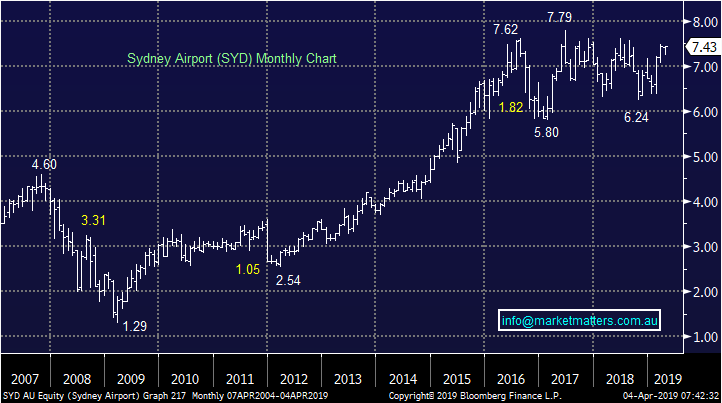 Sydney Airports (SYD) has been a huge benefactor of lower interest rates post the GFC – SYD still yields over 5% unfranked hence no impact from a likely Labor victory in May. We believe the headwinds are slowly building for SYD with Chinese travellers losing appetite for our shares and the risks of a rising $A top of our list. Another pop higher to test the $8 area would not surprise but this is not a move we would be chasing. MM is bearish SYD ultimately seeing a test of least $6. Transurban (TCL) has benefitted from lower interest rates post the GFC and higher tolls plus more roads & more traffic, something most of us experience weekly! 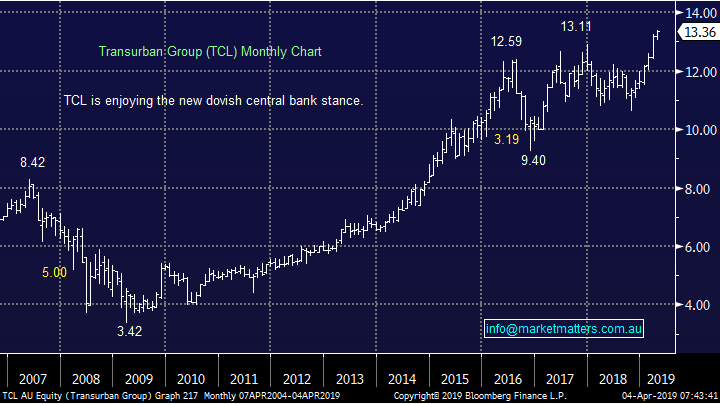 TCL currently yields over 4.2% largely unfranked hence no impact from a likely Labor victory in May. Moving forward car sharing, automated cares etc may become a disruptor as one car one driver becomes a rarity. We can see $14 short-term but we believe the risks are mounting at current levels. MM is bearish TCL ultimately seeing another test of $10. No introductions required for this wealth destroyer over recent years but MM is long the stock and making money at this point in time – TLS is still yielding an attractive 5.74% fully franked. Due to the internal issues with the stock / company we don’t believe TLS is as aligned to the “yield play” as it was a few years ago. However we still intend to at least reduce our holding into anticipated strength towards $3.50. MM remains bullish TLS, at least short-term. MM has no interest chasing what we believe is the last few crumbs from the “yield play” advance since the GFC . "car sharing, automated cars , and one car one driver becomes a rarity "..... how far into the future are you investing ??? that scenario won't be happening for decades !